FREMONT, Calif.—October 30, 2017- Cleantech Open West is proud to announce the Global Forum Competition finalists for the 2017 Cleantech Open Western Region Awards & Innovation Showcase. 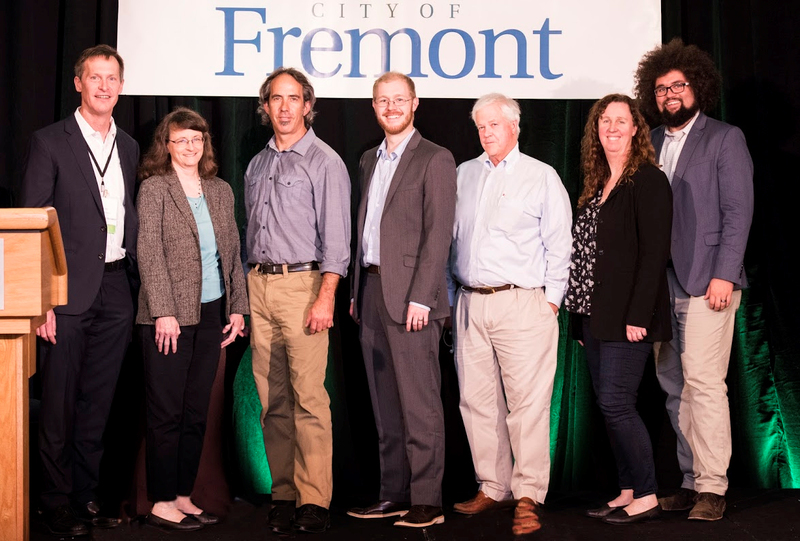 Hosted by the City of Freemont on October 17, 2017, the awards ceremony is a culmination of the organization’s annual acceleration program for early-stage cleantech companies. Finalists will advance to Clenatech Open’s Global Forum to be held January 2018 in downtown Los Angeles. Regional Winner: Novasolix – NovaSolix is building a new type of solar device that uses carbon nanotubes as antennas and can convert light to electricity from infrared (IR) to ultraviolet (UV) wavelength frequencies. These new devices are more than twice as efficient as photovoltaic (PV) devices; 1/5 the weight; and 1/5 the cost. The This year’s speaker program highlighted California’s expanding leadership in cleantech innovation, including a cleantech commercialization support panel and fireside chat with Ira Ehrenpreis, Managing Partner of DBL Partners and Matt Petersen, President and CEO of the Los Angeles Cleantech Incubator (LACI). Petersen also delivered the keynote address on LA’s important role in advancing California’s cleantech commercialization leadership in the global market. To amplify and connect regional, national, and worldwide impact, LACI and CTO have aligned resources toward building an inclusive global green economy. LACI’s Network for Global Innovation (NGIN), combined with CTO’s Global Cleantech Innovation Program (GCIP) and Global Ideas programs, now intersect to provide expanded reach for connecting ideas/innovation to global capital/markets. The event took place in the Fremont Innovation District, the core of Fremont’s rapid and ongoing evolution as a hub for Bay Area advanced manufacturing—the place where hardware start-ups go to scale. Featuring more than 30 early-stage cleantech start-ups, the event included 16 cleantech start-ups from the 2017 accelerator cohort. The two-day event began with closed-door judging, speed-dating between investors and Western Region start-ups, and a VIP networking reception. Day two was a public event beginning with an Innovation Showcase/expo in the morning followed by CTO’s annual awards celebration and luncheon with a speaker program and awards ceremony announcing CTO Western Region winners. Cleantech Open’s Western Region conferred 3 Awards for overall excellence. Award winners receive $10K in cash and services and advance to represent the Western Region at the Global Forum. company has built working proof of concept devices and is working on building their prototype product. Regional Winner: Opcondys -Opcondys is developing the opticondistor (OTV), a revolutionary power switching device for original equipment manufacturers who make high voltage equipment. Its greater power handling capability and energy efficiency will allow them to design smaller, lighter, more energy efficient products. Unlike existing semiconductor devices, the opticondistor does not have a limiting junction but allows power to flow through the bulk of the device. This patented device is the next generation in power switching. Regional Winner: Tiny Farms– Tiny Farms is pioneering the scalable production of insects for use in food, pet food, and animal feed as a sustainable alternative protein. Applying design thinking, IoT, and automation, Tiny Farms built and operates a smart, easily scalable cricket farming system that is providing high quality, affordable and sustainable protein to the pet food industry. Business Model / ROI: Whisper Energy Systems – Whisper Energy Systems, Inc. is excited to announce the development of the Zero Emission, Universal Source of 120VAC (ZEUS 120VAC)-a rugged, rechargeable, highly portable source of high-output, pure sinewave 120VAC power. The ZEUS 120VAC can operate any 120V device that you plug into the wall outlet and will have wide-scale commercial application in the following marketplaces: emergency preparedness; residential back-up power; construction contracting; landscape maintenance; and outdoor events. Impact: Advanced Paving Technologies – APT can Build a Better Road – Faster, Cheaper and Cleaner! We use Lidar scanners to accurately map out road deformities and then model and deliver a 3D shaped asphalt layer that will transform a bumpy surface into a smooth flat road without having to grind it down flat. This will maximize compaction and prevent potholes from forming to extend the life of the road. By streamlining road construction, we can reduce costs and traffic congestion as well as the overall carbon footprint. Sustainability: CarbonQuest – Carbon Quest provides wastewater treatment services that recover nutrients using a carbon negative process. Our initial focus is helping municipalities meet increasingly stringent nutrient regulatory constraints by taking algae grown on secondary effluent through to a carbon sequestration step via pyrolysis. This step recycles CO2 for algae, yields co-gen energy from methane, and a biochar amendment for agriculture. Emerging Technology: General Engineering & Research – Adoption of hydrogen fuel cell vehicles has been slow due to the lack of infrastructure. We are working to increase availability of clean hydrogen fuel by developing high efficiency magnetic refrigeration technologies to facilitate safe and economical transport and storage. Magnetic refrigeration utilizes the magnetocaloric effect (MCE), which is the temperature variation of a magnetic material after exposure to a magnetic field. This is a promising high efficiency refrigeration technology for many applications. Finally, our audience of 170+ cleantech innovation and entrepreneurship insiders selected a People’s Choice winner from among the 6 start-ups nominated for the Western Region Awards. People’s Choice: carbonBLU – The BLUprint platform empowers users with the tools they need to develop sustainable fleet plans. Developing plans to integrate alternative fuels, reduce fleet size and optimize asset use currently require considerable time and resources. The BLUprint platform automates and streamlines that workflow, encouraging proactive and progressive decision making. The Cleantech Open program in the West is made possible through the generous financial support of our corporate sponsors Wells Fargo, Daikin, Pacific Gas & Electric Company, Dorsey & Whitney LLP and the financial support of the State of California through the CalSEED, Energize California, and Bluetech Valley grant programs. As the world’s largest cleantech accelerator, Cleantech Open finds, fosters, and funds entrepreneurs with big ideas that address today’s most urgent energy, environmental and economic challenges. Since 2005, 1,250+ start-ups have participated in its annual accelerator and mentorship program in the United States, representing $1.2 billion in investment and the creation of thousands of jobs. The Cleantech Open’s international efforts span 43 countries through the Global Cleantech Innovation Program (GCIP), a joint program with the Global Environment Facility (GEF) and the United Nations Industrial Development Organization (UNIDO), as well as the annual Global Ideas competition in collaboration with Global Entrepreneurship Week (GEW). Now a program of the Los Angeles Cleantech Incubator (LACI) and fuelled by an expanding global network of more than 1,000 volunteers and sponsors, Cleantech Open unites the public and private sectors in a shared vision for making the cleantech sectors a thriving economic engine around the world. For more information, visit www.cleantechopen.org, or follow us on Twitter and Facebook (@Cleantechopen). The Los Angeles Cleantech Incubator (LACI) is a private non-profit organization helping to accelerate the commercialization of clean technologies and ensuring an inclusive green economy by unlocking innovation, transforming markets and enhancing community. Founded as a cluster-driven economic development initiative by the City of Los Angeles and its Department of Water & Power (LADWP), LACI is recognized as one of the most innovative business incubators in the world by UBI. In just five years, LACI has helped 65+ companies raise $135M in funding, create 1,500 jobs, and deliver more than $335M in long term economic value. LACI operates out of the La Kretz Innovation Campus in downtown LA with satellite offices in Northridge and the Silicon Valley, and is founder of the Network for Global Innovation NGIN. LACI recently acquired the Cleantech Open to amplify and expand their positive impact toward building an inclusive green global economy. For more information, please visit http://laci.org and follow us on Twitter and Facebook @LACIncubator.